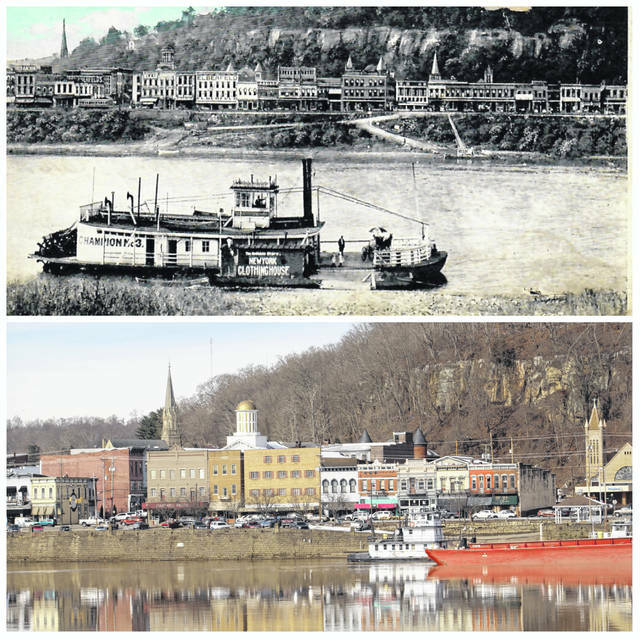 Downtown Pomeroy can be seen from the Mason boat ramp area in these two photos. The top photo appears on a post card from the collection of Carl DeLong and is undated. In the photo the ferry can be seen docked in Mason to take people to Pomeroy. Many businesses can be seen along Main Street, as well as the dome of the Courthouse and the top of the steeple of the Catholic Church. Noticeably different is the riverfront area with the absence of the current Pomeroy Parking Lot. The bottom photo, taken approximately two weeks ago, shows downtown as work is taking place on the parking lot. Also visible is the dome of the Courthouse, as well as the steeple of the Catholic Church.